"There is no wasting energy now. Everything is for these next three days in the mountains with the leader's jersey. We have done the training, now it's up to us." 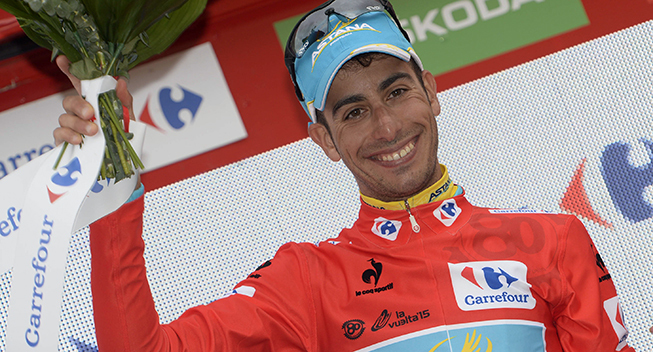 Those were the words of Astana's Alessandro Vanotti after stage thirteen at the Vuelta a España. Vanotti sat at the front of the peloton with his teammates to close the gap to a 24-rider breakaway filled with riders from teams in search of a stage win and less threatening in the overall classification. Diego Rosa, Dario Cataldo, Luis Leon Sanchez and Fabio Aru all finished in a group more than four minutes behind stage winner Nelson Oliviera of Portugal. With no changes, Aru remains race leader and keeps the Red Jersey into the three difficult mountain stages in the weekend around Spain's north coast. Most significant among Aru's competitors is time trial specialist Tom Dumoulin of the Netherlands, and team tactics will confront the need to create larger time differences between Aru and his various rivals in General Classification before the Vuelta's 38km time trial next week. "It went very fast today, we didn't have any time to breathe ahead of the three grueling days ahead of us because there was a large break with many good riders," Aru said. "With riders like Sicard and Brambilla who were not too far in the GC, we were forced to control the race. The guys did a fantastic job. Tomorrow is a very hard stage but I'l take them each day at a time and try to remain focused."